Every so often a tool appears that makes us think how we used to work before its existence. Nowadays, almost all tradesmen would support the view that impact drivers belong in this group. For years, workers and DIYers alike used to try and squeeze torque from drills in order to drive long fasteners and screws into harder materials, like hardwood, metals and even concrete. Furthermore, removing rusty old screws and bolts was a thing to dread. People use to leave a lot of half-embedded screws in things back then. Torque was a problem: ensuring that you had enough rotation force to make a turn. Regular drills just did not do enough to do the job well and when drilling there was a lot of stress put on the fastener or screw. In the new millennium, impact drivers arrived and have made a massive difference to the workplace for many professionals and to the home for the DIYers amongst us. We really think that they are now an essential tool. If you are not sure what you’re looking for or how to find the best impact driver then read on as we will provide you with all of the knowledge and reviewed products of the best 10 impact drivers out there. Don’t just take our word for it: they include many of the top rated impact drivers on Amazon too. Here at Stuffoholics, we have been reviewing and research impact drivers for years. To date, we have tested over 30 impact drivers! We have shortlisted our top ten best impact drivers through over 60 hours of research, large-scale community-based usage data and personal testing. We maintain this effective protocol to ensure that we uncover the best quality at a reasonable price for our users without focusing on any particular brand. Indeed, our fact-based research is driven by our need to find the best product on sale today. Read on to find out our top ten best impact drivers. So, before we begin, what is an impact driver exactly and what are they used for? An impact driver is a type of tool that provides a sudden, strong downward and rotational force. They are used by all manner of DIYers, mechanics and workmen and women to loosen screws or nuts and bolts that have frozen due to the corrosion being over-torqued. The direction of the rotation can also be reversed if screws need to be tightened more than is possible or easy with a screwdriver. They have much more power and force than other conventional drills and screwdrivers, making them very versatile tools. 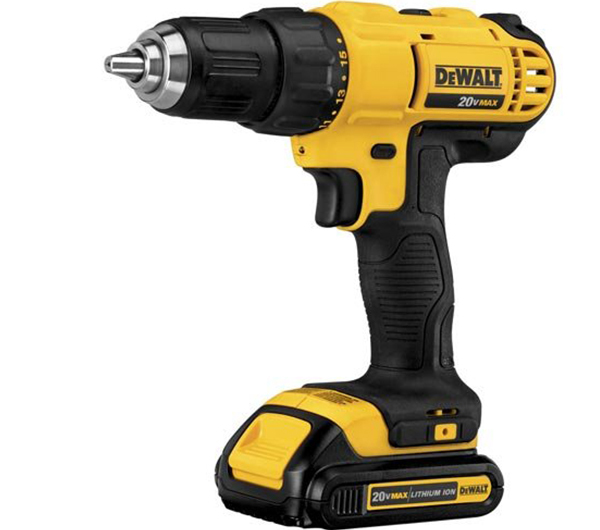 What Can an Impact Driver Do That a Screwdriver Can’t? Construction workers and DIYers look at impact drivers as being big, powerful screwdrivers. Impact drivers are motorized allowing for greater ease and comfort than the human hand can provide with a regular screwdriver. Using a manual screwdriver for extended periods of time is one of the causes of Lateral Epicondylitis, also known as tennis elbow. An impact driver is a handheld power tool, meaning that if your hands are weaker you can still use it with ease. The user simply holds it up to the work surface, taking out the tension and torsion required with a manual screwdriver. They can be held with just one hand too, leaving the other hand available to keep the object in question steady to ensure a perfect job. Impact drivers, as implied by their name, deliver constant impact when they are turned on. This means the need for manual pressure, as with manual screwdrivers, is not necessary. There is very little force required while using an impact driver, in comparison. They are also versatile tools, capable of many other things as well as driving in screws. They can be used to bore holes and many of them have a high torque mode which means that, when combined with a large bit, the worker easily creates big holes in tough materials. They can also drive longer screws due to their high torque – a distinct advantage over many other handheld tools. The screw recess will easily hold longer screws, which are often susceptible to wiggling when they are used with a manual screwdriver. There is so much force due to the torque that they do not wiggle out of place. Impact drivers without doubt put less strain on the wrist than regular drivers because there is no need to twist the arm. These tools eliminate the need for a regular screwdriver and a hammer drill too. We need to look at the typical features of these tools before we jump into our reviews of the best impact drivers on sale today. When it comes to the weight of the impact driver you should note whether it comes weighted as a bare tool or whether the battery is included. While the bare tool weights are, of course, lighter, you need to consider the weight of the tool when the battery is attached in order to make a fair comparison and judgment before considering your options. Impact drivers are most definitely more ergonomic than their drill cousins due to their lighter weights and smaller sizes. The ideal overmold should be made from rubber around the handle, which should extend to the base of the housing for the motor. This ensures extra comfort for the user’s hands and fingers. The rubberized overmold, as mentioned above, protects the tool’s plastic housing when it is placed on its side – or when it falls. This is certainly something that should be considered for the 12 Volt models because the batteries of these are smaller and therefore less likely to make a base to stand the tool upright when not in use. Most 12 Volts are therefore positioned laying down when not in used and so a rubberized overmold is ideal. Depending on your need for an impact driver, you should consider the sound level that they produce. Construction workers who use them for extended periods of time may wish to factor this into their choice of driver due to the residual effects that overuse of power tools can have on hearing. Most handheld impact drivers available today are cordless. This is due to the lack of availability of corded models and so the main thing to consider is the battery’s capacity and how long recharging takes. In terms of power, impact drivers are usually powered by either 12 Volt, 18 Volt or 20 Volt batteries, with the larger numbers evidently delivering more power than the lower. However, it should be noted that there is actually no difference in an 18 Volt and a 20 Volt battery – just check the small print of your tool for confirmation of this surprising fact; it’s simply a clever marketing ploy! The best kind of batteries to look for are lithium-ion (Li-ion) batteries. They are on the more expensive side but they don’t tend to suffer the “memory effect” of other types of batteries like nickel cadmium (Ni-Cad). Lithium-ion batteries provide more power for longer periods of time and offer a better, fuller recharge. Of course, recharge times can vary from as little as 20 minutes to well over an hour, so this is something that you need to consider when choosing the impact driver that’s best for you and your needs. Impact drivers have many features in terms of control. They will all have a reverse/forward switch and a trigger. For ease of use, you should be able to change the direction without a problem between your index finger and thumb. Some impact drivers have a neutral setting which locks the trigger too so that the battery doesn’t use any unnecessary power if the trigger is accidentally pressed when in a toolbox. Of course, the battery could also be removed if the impact driver does not have this control feature. Some of the batteries now come with fuel gauges and some have a gauge tool. For those with tools, the battery needs to be inserted into it to see the discharge status, which is not as convenient as it being visible on the battery itself. Work lights are commonplace on impact drivers, ensuring even the darkest of corners can be seen easily. Also, a belt hook is a serious consideration, especially if climbing ladders or pausing in between uses. Some have ambidextrous hooks to attach to either side of the tool. Hanging the impact driver from your belt is most certainly easier than repeatedly having to pick it up and put it down when working, especially for the pros among us! Of course, it should go without saying that a good tool comes with a good warranty. Be sure to check the length of your chosen tool’s warranty – if a company backs its product with a good-length warranty they are sure to be reliable and trustworthy. Who Are Impact Drivers For? Impact drivers are a really versatile handheld tool that can be used by almost anyone. As mentioned, they take the force from the user and provide it. 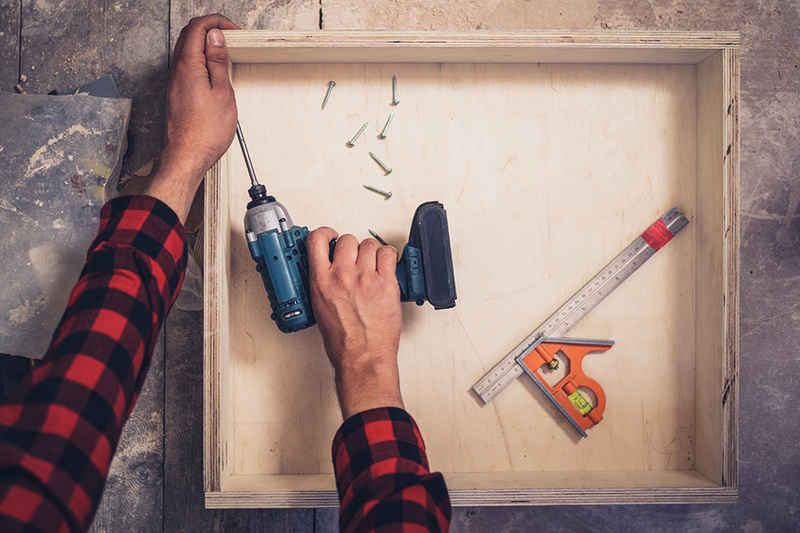 This means that DIYers and construction workers can use one easily without the risk of injury or recurring tennis elbow as is frequently found in those who operate manual screwdrivers frequently. They are light in weight and easily transportable meaning that they are not too cumbersome for prolonged use in professionals. Indeed, some models come with added belt loops to allow hands-free movement which is particularly useful for those who use the tool when scaling ladders! They are also an easy tool to become acquainted with and therefore are suitable for the novice woodworker or DIY job. Most impact drivers require little in terms of set up too. So, whether amateur or pro, an impact driver is pretty much an essential bit of kit in your tool box these days! Let us help you find the right one for you. In order to choose our best impact drivers, we had a thorough selection process and practical testing by a number of volunteers. We also took into consideration the opinions of experts and their personal choices. Out of a possibly 50 impact drivers we have tested about 30. It would not be right to say that any of the units we tested was flawless or perfect. However, based on our selection process we have shortlisted the best ten. Our volunteers focused on specific features such as the design and build materials, weight, ergonomics, sound levels, specification in terms of power and performance, battery capacity and recharge time, any control features and any attachments and warranties. Based on these focus points we believe that we have selected the best ten for our impact driver reviews. For our top ten product reviews, we analyzed 43 of the most important features of each impact driver. You are welcome to read our detailed research report in order to help you decide on your best product – simply like any of our social media pages in order to read it. This is our number one pick, because of its huge amount of great features. As well it is good value and affordable, so is just the driver for a little money. In the analysis of the 43 best features of impact drivers, this product contains the maximum number of positive and significant features. As a result, we have determined that this is our top-of-the-list choice. On our research report (that you can view by following one of our social media pages), this best impact driver is full of amazing positive features. This unique driver has a high-performance motor which delivers 300 unit watts out (UWO) of power ability meaning it can be used for a wide range of applications. It has high-speed transmission offering two speeds for a variety of drilling and fastening applications. It is in an affordable price bracket too even with all of these positive features and really good value for money. We compared the rating frequency of each of the products for their 30 most recent ratings on Amazon and found that this product is receiving ratings at a very good rate. It received its first ten ratings in five days, its 2nd ten ratings in three days and its third ten ratings in just two days, making it a very popular product indeed. This impact driver is just what you are looking for if you are after power at a minimal investment, suiting even the most demanding workshop or home DIY needs. This cordless impact driver from DeWalt certainly fits the bill where the number one spot is concerned. It. It is small and durable and made from high-quality steel parts. This impact driver is compact and light. It weighs in at only 3.64 pounds (including the battery) and measures 13.9 x 9.9 x 4.2 inches. It is made with an ergonomic handle for maximum control and comfort. It also has LED lights enabling the user to see the job in hand even in the smallest of dull spaces. The drill packs in an impressive 300 watts of power which is impressive for a driver in this price band. It also has a variable speed capability which allows you to choose between 0-450 revolutions per minute (rpm) or 0-1500 rpm, depending on the task which is being carried out. The motor is powered by a Lithium-ion battery and comes with an additional battery back so that one can be charging while the other is in use! No need to stop what you’re doing while you wait for a recharge! A recharge only takes between 30 minutes and an hour too! This product features a ½ inch single sleeve ratcheting chuck which offers tight gripping strength for your drill bits. As mentioned, LED lights illuminate the areas in which you are working to make jobs in low-light conditions or tight corners even easier. It is even certified as “frustration-free”! This impact driver comes with an impressive 3-year limited warranty! DeWalt really backs their products ensuring that they are therefore of the best possible standards and quality. Furthermore, this DeWalt product comes with two 20-Volt compact Lithium-ion batteries, a small charger and a robust contractor storage and carrying bag. It is tougher to use on some of the harder hammer drilling jobs such as metal or concrete surfaces. The reviews of this cordless product speak for themselves. It has over 3700 reviews on Amazon with an average rating of 4.6 stars! It is fairly portable and suitable for professionals and DIYers alike. The robust motor will complete your jobs easily. Even with its impressive features, it is still available at a price which won’t break the bank and comes from a well-respected manufacturer who stands by their products by offering a 3-year warranty. This is why it occupies our top spot for the best impact driver out there today. This driver has so many brilliant features you won’t know where to start! It’s a little more expensive than our top pick, but will no doubt suit your needs. 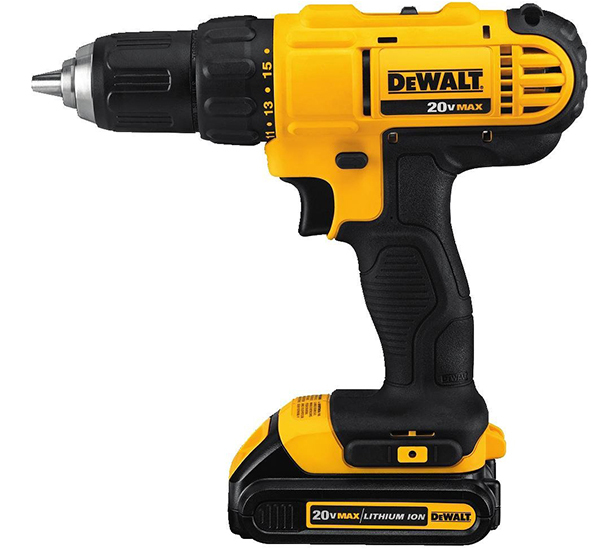 Our runner up in the top impact driver stakes is also another DeWalt: the DCK240C2. We have chosen it as our runner up because it has as many positive features as our top pick with a wonderful combination of significant features in addition, as you can see from our research report. It’s a lightweight impact driver which is designed to suit the users’ needs. It has a high frequency of ratings of verified Amazon ratings, although not as high as our top pick. It received its first 10 ratings in 10 days, the second 10 ratings in 5 days and the third 10 ratings in 7 days. The price of this DeWalt tool is higher than our Top Pick, hence why it comes in at a close second. This cordless DeWalt tool packs in a host of positive features. It is compact in size, measuring 15.1 x 6.4 x 9.9 inches and houses a brushless motor. It comes as a part of a kit with an impact driver and a drill/driver tool. This 2nd best impact driver in our list is very lightweight, weighing in at 2.8lbs compact enough that it won’t cause user fatigue over prolonged usage periods. It is easy to use with one-handed loading too, making changing bits a piece of cake. It has a ¼ inch hexagonal chuck and fits 1inch drill bit tips. This tool is a top performer with a high-quality powerful motor. It provides 300 UWO of power making it suitable for a wide range of jobs both in the home and professionally too. It has two-speed settings of 0-450 rpm and 0-1500 rpm, allowing the user to select the best option for their job at hand whether drilling or fastening. It is powered by a 20-V lithium-ion battery with a second battery also provided. The battery can charge up in a relatively short space of time. Furthermore, the tool is compatible with DeWalt’s Max batteries so if you have additional DeWalt tools the batteries can be recharged and interchanged between tools too. It features a useful ring light with three powerful LEDs which has a 20-second delay after the trigger release meaning that the user can still see the working area in dimly lit areas and darker corners even if not operating the tool. It also has a belt hook which increases its portability in the home or workplace making it even more practical to use on the go when completing multiple or complex jobs. The tool comes in a handy kit with two 20 Volt Lithium-ion batteries (1.3Ah), a charger and a useful contractor bag. Furthermore, the kit is protected by the manufacturer’s three-year limited warranty. DeWalt really stands by their products, guaranteeing their longevity and durability of use. Users have reported that the chuck needs tightening on occasion. 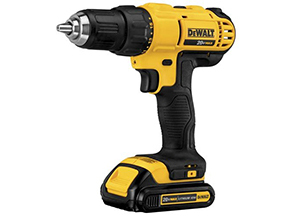 This DeWalt tool is aimed for casual users or users who want a combination tool of a drill and impact driver. With this tool, the user can handle many tasks that basic, entry-tools cannot and it is much easier to use than some of the more advanced drilling tools on sale today. If you are looking for a more complex piece of kit than our top pick with a drill driver too, then this may be the choice for you. DeWalt branded products speak for themselves in their popularity and reliability too. If you are looking for a scarily cheap driver which still has some good features, then this is the pick for you! Cheap and still effective. Our budget choice is the Ryobi One+ P236 Cordless Impact Driver. From our research report, you can see that it is the lowest value of all of our impact driver reviews. Despite this, it also has the maximum number of positive and effective features of all of the lower priced products. For example, it has tri-beam LED lighting that lights the working area when the trigger is activated, allowing the user to see the area even in poorly lit areas. It magnetic tray also keeps bits and fasteners on the unit allowing you to operate hands-free to increase the stability in operating the tool. In terms of its Amazon rating frequency, it is also good – check it out on our research report. All of these wonderful features and the impact driver still comes in at under $70 in price! It is clear why we have chosen it as our best impact driver choice for those on budget. This Ryobi tool is certainly a budget buy looking at the price bracket that it falls into. Bearing in mind the price, you often don’t expect to get a lot of power and performance for your money but this one ticks a lot of boxes in these areas and is really quite surprising in terms of impact driver performance. It is sold as a bare tool, measuring 12 x 3 x 9 inches. This impact driver has a rubberized notched overmold on the grip which allows the user to keep a tight hold on the driver for increased accuracy, even if you have slippery hands or are working at awkward angles. The tool itself is lightweight, weighing 2.56lbs but it is sold without the battery attached and so this needs to be considered in terms of its ergonomics and usability too. With the battery attached it is a little on the heavy side. This tool holds a lot of power in the compatible batteries. It can be used with any One+ 18V batteries meaning that any of the batteries, whether lithium-ion or NiCad, are compatible with the tool. With a 4.0Amh battery, it has a long-life use, much more than other similar power tools, which is quite impressive. In terms of power, it has up to 3200 rpm and as for torque, it is capable of 1600 inch pounds. This more than adequate for most jobs around the home. As mentioned, this tool has LED Tri-beam lighting which illuminates the workplace when the trigger is activated allowing the user to see the work area clearly. It also boasts a magnetic tray which keeps bits and fasteners on the unit allowing the user to have hands-free. The bits are easily replaced too. The user just pulls out the collar and slides in the bits without the need for any tools. The Ryobi One+ comes with a Phillips bit in the base of the tool which is a welcome addition for such a reasonably priced tool. It does not come with any other accessories and, as mentioned, it also works with any One+ battery but, unfortunately, one does not come with it as standard. 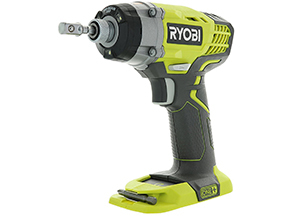 Ryobi also offers a 1-year warranty on this power tool. This driver performs exceptionally well in terms of Amp per hour for the battery life. It is great value for those on a budget who are most likely to be using the impact driver for DIY jobs in the home. Although a little heavy when the battery is attached, it has some fantastic features so as the magnetic tray and LED tri-beam lights which are often boasted features of higher priced items. If money is tight, this could well be the right choice for you given how it really is a top budget buy. Choose this driver if you are looking for the latest model and a truly advanced pick. It comes with an impressive amount of features and power, that there is no doubt it is the professional’s pick. It’s another DeWalt product for our Advanced Pick. Clearly, DeWalt’s reputation by now precedes them. This impact driver is one of the most advanced ones that we have found for sale on the market today. None of the other tested products has as much torque power as this product. It also houses a brushless motor that delivers 3600 impacts every minute. For versatility, it has 3-speed settings and a Precision Drive for additional control. Additionally, it has one-handed loading of the ¼ inch hexagonal chuck as well as an easy to grip sleeve for the 1” bits. It is slightly more expensive than our other tested products but it is the only one of our reviewed impact drivers that has several advanced features that professionals and experienced DIYers are looking for. This is why we have selected it is as our advanced pick. This 20V is a compact yet powerful and high-quality handheld impact driver from DeWalt measuring 16.2 x 4.5 x 10.1 inches with a DeWalt-built brushless motor. This DeWalt tool boasts a lightweight compact design, allowing you to do jobs in even the smallest of tight spaces. It is 2mm shorter than the previous model too. It’s easy to use with the one-handed loading of the chuck with a bit sleeve that is very easy to grip too. 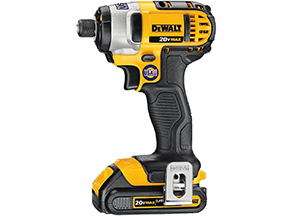 The compact housing hosts a powerful brushless motor capable of much more than other similar tool and is the first DeWalt 18/20 Volt impact driver to reach these heights in terms of torque. The DCF887 generates up to 3250 revolutions per minute with approximately 3600 impacts per minute, which are pretty impressive stats! There are three power settings on this tool with the first setting being useful for light, screw driving jobs and gradually increasing the power and torque for heavier duty jobs. In speed 1 it has DeWalt’s ‘Precision Drive’ for added control in intricate jobs. The tool is powered by XR Li-Ion batteries which provide extended run time and capacity than standard units. This DeWalt product features useful charge indicators on its batteries letting the user know when they need to recharge. The three LED lights illuminate darker areas while you work with a 20-second delay for extended lighting once the trigger has been released. Everything is lit up without any shadows. It comes with a practical belt loop ensuring easy use when getting any jobs done. Additionally, it has two batteries enabling one to be charging whilst you use the other, as well as a fast charger, charging in just 45 minutes! Lastly, it can all be stored neatly in its accompanying kit box. This DeWalt impact driver really has it all for the advanced workers among us and has an awesome average of 4.8 stars out of 5 on Amazon. It is second to none in terms of power and performance in comparison to our other impact driver reviews. It comes complete with everything that you need for immediate use and is suitable for the professionals yet it not too complex to use for the novices too. The downside is its price. But, as the adage goes, you do get what you pay for! This driver is so compact you won’t believe it! Its simple and small design, make it portable, while still being packed full of great features. Why is this product Best Compact Choice? In terms of compactness, we recommend yet another DeWalt! This time, the DeWalt DCF887B 20V. The reason why this is our best compact impact driver choice is simply due to its small and lightweight design. It is still full of positive features despite its size. It is the lightest of all of our reviewed products, weighing just 2lbs. 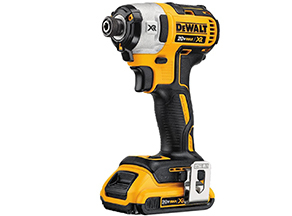 The compact driver has a variable-speed trigger, with three speed settings and also has DeWalt’s Precision Drive for extra control. Due to its small size, it is able to do jobs in even the tightest of spaces. Measuring just 3 x 8 x 5.88 inches, this DeWalt DCF887B is a bare tool feature a DeWalt-built brushless motor. It accepts 1-inch bits in its ¼ inch hexagonal chuck. 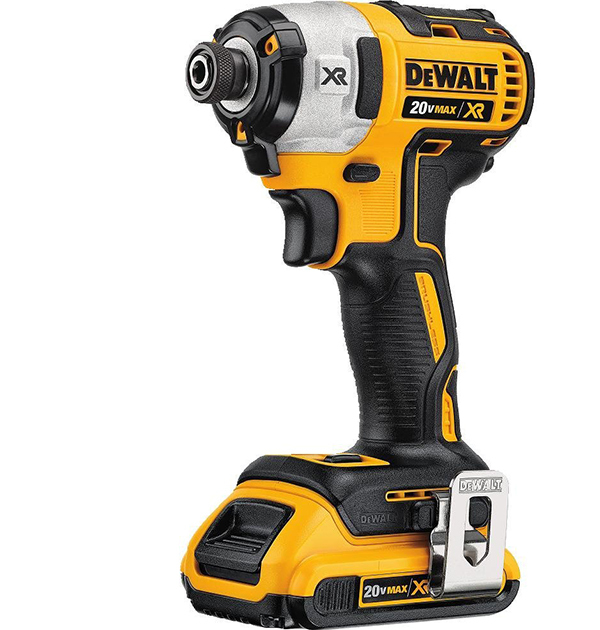 As described, this is our most compact driver in all of our impact driver reviews. As a bare tool, it weighs just two pounds and is lighter than all of the other products that we have reviewed here. It is extremely small and compact meaning that you can easily use it in really small spaces or at difficult angles without any difficulty. Despite its compact size, it still packs a punch when it comes to power. With a 20V battery, it can power through tough jobs with ease due to its three speeds and variable speed trigger. It operates at an impressive 0 to 1000, 2800 and 3250 rpm, although it only operates at 800 impacts per minute which is less than some of our other reviewed products. Like many other impact drivers, this one also has three LED lights to illuminate the working area for greater productivity and ease of use in dimly lit areas. Also, the lights are on a 20-second delay allowing the user to continue to see the task in hand even after the trigger has been released. Unfortunately, this is a bare tool and, as such, this does not come with a battery, a charger or attachments. As such, the additional cost of these should be factored into your purchase and could push up the price considerably if you don’t already have a compatible DeWalt battery and charger pack. However, it does come with a pleasing 3-year warranty. DeWalt really supports their customers with these warranties and, as such, it is worthwhile considering these products due to the excellent warranties that come with the purchase. Sold as a bare tool, without charger or battery. If it’s smallness you’re after, then this is the tool for you. It is lightweight and compact, reaching even the smallest of spaces and tight angles with its LEDs lighting up darker spaces. Despite its small size it still packs in plenty of power too and has an impressive three-year warranty. However, bear in mind that you will need to buy a battery pack and charger if you do not already own any compatible DeWalt products as these accessories do not come as standard. 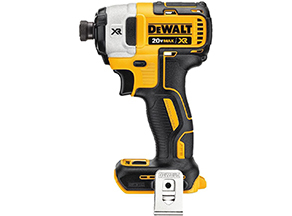 This DeWalt tool measures 5.5 x 9 x 3 inches, making it one of the compact impact drivers in our list. It is a highly rated tool on Amazon with its first and second ten ratings received in just 9 days each and the final ten ratings received over just 10 days. It is the third best in terms of the frequency of its ratings of all of our reviewed products with an average star rating of 4.6 stars. It has a ¼ inch hexagonal chuck accepting 1-inch bits and can be loaded easily and simply with one hand. The robustness of this model ensures that it can withstand the wear and tear of any workshop environment associated with frequent use. This DeWalt tool, whilst not the lightest among our impact driver reviews, is compact and still lightweight at only 2.8lb. Its ergonomic design ensures that it can easily carry out jobs in the smallest of spaces. It can also be loaded one-handed. It has a pleasing 1400 in-lb. torque with a speed range of 0-2800 revolutions per minute with 3200 IPM making it an ideal tool for cabinet makers or other professionals such as steel stud framers, HVAC professionals of other contractors who regularly complete fastening jobs in tight spaces or overhead. As a part of the Max System, the 20V lithium-ion battery packs in the power and boasts less downtime than other impact drivers. This model also has increased visibility with built-in LED lights with a 20-second delay after the trigger has been released for continuous monitoring of the job in hand. For portability, it has an all metal belt hook, allowing users to let the tool loose for hands-free possibilities in the middle of longer jobs or when working at height. It comes with one 20V battery as standard and with a fast charger too. Additionally, a three-year manufacturer’s warranty gives users peace of mind. Excellent frequency of ratings on Amazon, with 4.6 stars average rating. 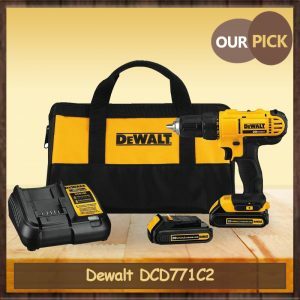 This is a popular, well-liked buy from DeWalt which is suitable for almost all jobs. It is lightweight, compact and ergonomic and fitted with a belt-hook meaning it is even more practical. However, a slight downside is the size of its battery at only 1.5Ah which some users say is not long enough for longer, more complex jobs. Furthermore, some of the pictures on Amazon are misleading and clearly show the tool with a 3.0Ah battery. However, putting that aside, this tool packs a punch and has some real power in the brushless motor which is a real asset. It would work well in any worker’s toolkit. This is a great tool for a professional workshop. It has extra features galore, and great technological advances. Because of this it does come in a little expensive. This Makita 18V LXT Cordless Impact Driver with lithium-ion battery gives power and speed despite being a compact size, suitable for a wide range of fastening and driving tasks. The Makita 4-pole motor has 4 brush design produces 26% more revolutions per minute and does not decrease the torque. The gears are housed in all-metal casing, which increases the durability of the impact driver, especially when used in dusty and dirty job site areas. Additionally, it boasts the feature of Extreme Protection Technology (XPT) which is designed to increase the tool’s resistance to water and dust in construction and workshop areas. The hammer and anvil mechanism driving the impact is built with the best materials and the highest quality steel with a unique hardening process to deliver the best possible driving power. The handle of this unit is ergonomically designed with a soft, rubberized grip for the increased comfort of the worker, making working at difficult angles a breeze. Weighing only 3.9 with the battery included, operator fatigue is also kept to a minimum. This tool has a variable speed trigger with two settings: 0-2900 RPM and 0-3500 IMP. It has 1460 inch-pounds in terms of torque allowing the operator to use it for a vast array of fastening applications. The tool is part of Makita’s growing 18V Li-ion series, which is actually the world’s largest line-up for cordless tools which are powered by 18V slide-style lithium-ion battery. The batteries boast to have the fastest charge time in the categories and, as a result, more time is spent working with less time being spent waiting for a recharge! Furthermore, the batteries last a while by being 3.0Ah. The tool has a convenient and practical one-tough quarter inch hexagonal chuck for the quick changing of bits and also features two LED lights with a delay afterglow allowing the work area to be illuminated for a while after the trigger has been released. Both the battery and the tool itself come with Makita’s 3-year warranty for peace of mind. With your purchase, you will also receive a tool case and a rapid optimum battery charger. This tool would make a great addition to any workshop and is ideal for any professional due to the added bonus of the Extreme Protection Technology, protecting the tool from the dust and the damp that is often associated with workshops or professional worksites. It comes with everything you need to get started, even a carrying case, and allegedly comes with the fastest charging 18V batteries in the category! With its impressive performance, this driver comes in as one of the best in class choices. It is light, charges quickly, but does have some downsides, like its 12v battery. 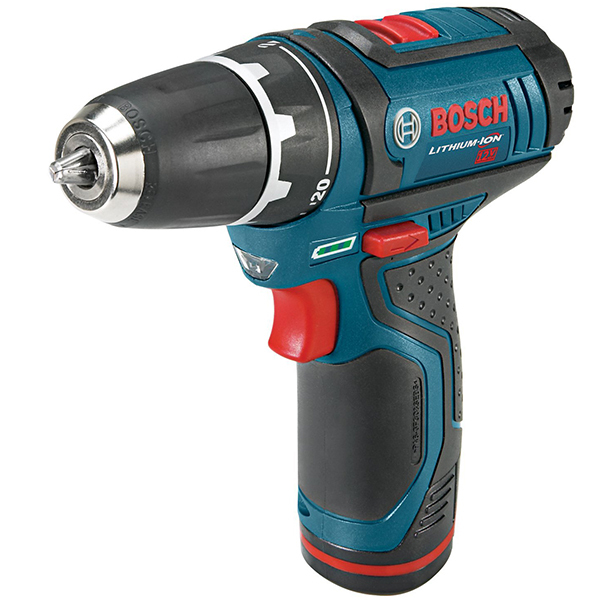 This Bosch tool is encased with Durashield housing meaning that it can cope with any conditions that it may find itself in whether on a professional job site or as a backyard tool. Durashield is a material made from an ABS/nylon composite which provides durable flexibility. Testing has shown that it can withstand repeated drops of 12 feet, which is unlike tools with traditional plastic housing. It also features a new single-sleeve 3/8inch three-jaw chuck which is useful for up to 90% of all jobs. The Bosch PS31 is a streamlined too which is able to easily fit into small workspaces and has a head length of 7 inches. The short length and lightweight 2lb body make it ideal to take to jobs that will be in tight places, difficult angles or surroundings. 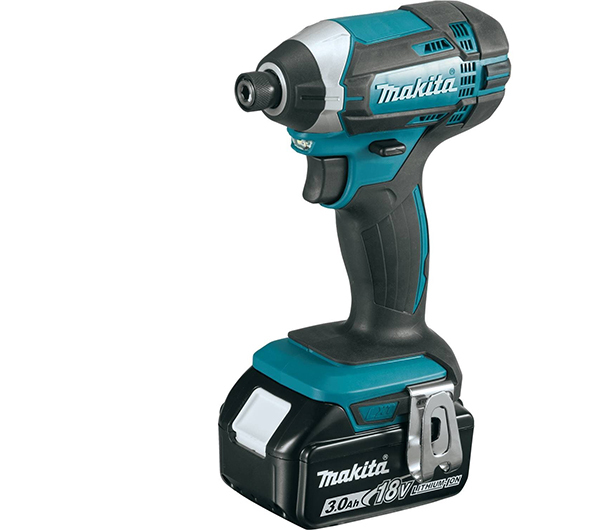 The 12V drill/driver is very lightweight and is one of the lightest that you can buy today. The Bosch PS31-2A boasts professional-grade power despite being remarkably lightweight. It has an excellent performance to weight ration which makes it ideal for plumbers, contractors and electricians who carry out many over-the-head jobs or jobs at difficult angles which often cause user fatigue. It is small but mighty, having 265-inch pounds of torque. This tool is fitted with a 12V battery, making it our highest placed 12V impact driver. It features two-speed settings of 0-350rpm and 0-1300rpm. You can really see the difference here in the power levels of this tool in comparison to some of our higher placed tools. It also has 20+1 clutch settings meaning that the operator can be precise in terms of torque for accurate drilling and screw driving. It is suitable for many materials including, but not limited to, wood, metal, drywall and even concrete. For increased visibility, the Bosch has integrated LEDs allowing the user to work anywhere at any time of day. It also has an integrated battery gauge on the side of the tool so that you are able to see how much power is remaining in your battery before needing a recharge. It comes with 2 12V lithium-ion batteries which increases its runtime, an ideal for professionals who do not have the time to wait for a battery to recharge. It also comes with a one year warranty. The charger is a fast charger, charging the battery in an impressive 30 minutes. Finally, it comes with bits and a contractor bag! In terms of performance to size ratio, it is the best in its class. This tool would be a great choice for professionals due to its robustness and durability thanks to Bosch’s Durasheild housing, even when dropped from 12-foot heights! Despite having a 12V battery, it is the best in its class in terms of performance to size ratio. It would make a great addition to any workshop, especially given its long battery life and fast recharge time! This driver boasts a great leave of performance, for a really affordable price. It is one of the best options in its size bracket, but its a shame its sold without chargers or a battery. This Milwaukee impact driver is a very popular choice on Amazon, with an average rating of 4.6 stars. It has a robust design to ensure its longevity and also boasts more run time and power than any of its brushed motor competitors. It has a Milwaukee 4-pole frameless motor and a ¼ inch quick-connect hexagonal chuck. This tool is sold as a bare tool and weights 2.65lb, making it lightweight as far as bare tools go but the battery weight also needs to be taken into consideration when comparing weights with other similar tools. This impact driver is small in size, measuring 5.69 x 2.93 x 7.85 inches, meaning that it is easy to use and not too cumbersome to use over extended working periods. The Milwaukee has some unique features. It has a Milwaukee designed Impact Mechanism which offers maximum application speed and power to increase job efficiency. It also has impressive REDLINK Intelligence. This provides protection from overloading by using complete system communication between the battery, tool and charger ensuring performance is optimized. Indeed, it is the most powerful compact impact driver in the 18V class and delivers the best ration for power to size amongst all its competitors. In terms of performance, it delivers 0-2750rpm, 3450 impacts per minute and a total 1500 inch pounds of torque, hence its position in its class! There’s an LED light to illuminate the working area and additionally, there is a reversible all-metal belt clip for the temporary storage of the tool! Unfortunately, this tool does not come with any attachments or accessories as it is sold as a bare tool. Therefore, despite its economic price, the battery and charger pack will need to be bought separately unless you are already in possession of a compatible battery pack and charger. It does, however, come with a manufacturer’s 1-year warranty. This tool would be an excellent addition to any Milwaukee tool owner who already has a compatible battery and charger back. Even if not, its economic price ensures that it is an affordable tool for almost anyone. 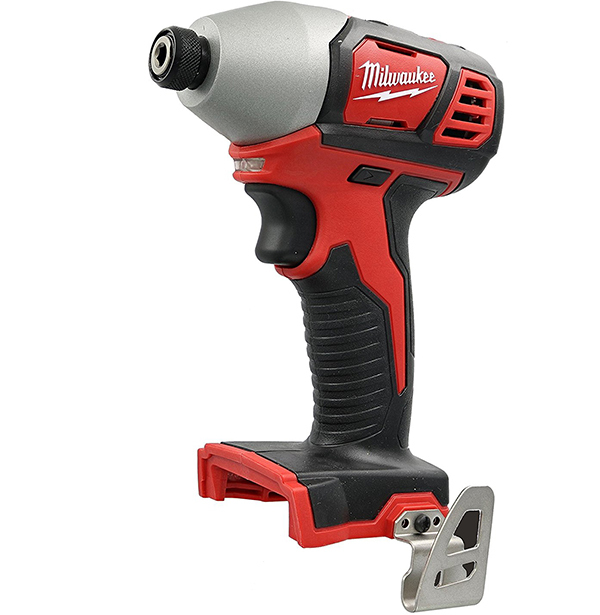 It has an impressive performance, highlighted as the best in its class for its size, so it really is worth considering, especially if you already own Milwaukee compatible tools and batteries. If you already have Milwaukee products then this driver will be a great addition to your workshop. If not, it lacks power as well as a charger and battery, so is missing some essential elements. Optimized for high-speed fastening, the Milwaukee M12 1/4″ Impact Driver delivers unmatched fastening performance in a lightweight, tool belt portable design. Milwaukee constantly strives to improve their products and this one is no exception. They have made a new more ergonomic design for the handle in order to increase comfort. It fits comfortably in the hand ensuring that there’s less user fatigue and increased user control. It weighs 2.3 pounds and it is fairly compact in size, measuring 8 x 5 x 16 inches. 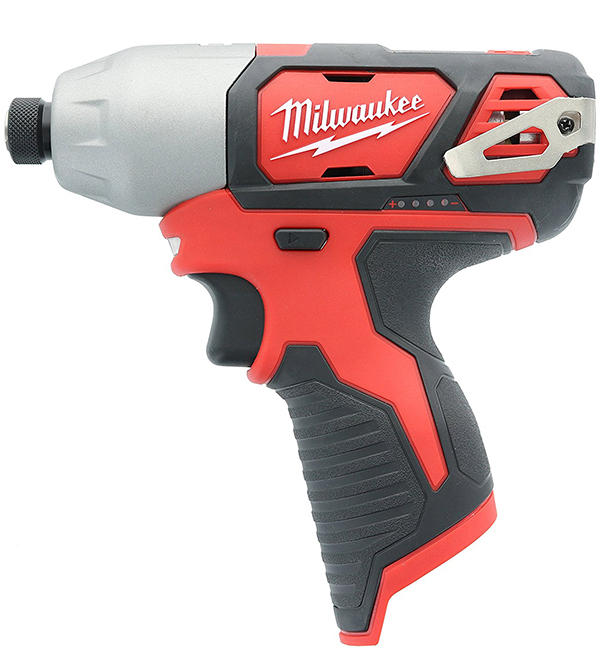 With its 12V battery, it delivers 1000 inch-pounds of torque thanks to the Milwaukee Impact Mechanism. It has a fastening speed of 0-2500rpm. It is a compact model but its torque and top RPM makes it a very powerful tool considering it runs on just 12 Volts. As for the 12 volts, they are provided my Milwaukee’s RedLithium battery (although one does not come provided with this bare tool purchase). We are not entirely sure what makes a RedLithium battery better than your average lithium-ion battery but, according to Milwaukee, they deliver more power and have 80% increased run time. They also take an increased number of recharges which may be something to consider when buying a battery to go with your bare tool purchase. One useful feature is the built battery gauge which displays the remaining running time of the tool. Also, another popular feature amongst testers is the work light, which has a reflector to the rear of it thus increasing the brightness and size of the lighted area. Milwaukee has also built in its RedLink Intelligence. This adjusts the power that the driver uses by reviewing information it receives from what action the driver is taking. This means that it results in a longer battery life and a reduced risk of battery overloading the battery or working the motor to a burnout. Despite being sold as a bare tool, the great thing about Milwaukee is that all the tools in this collection use the same batteries and chargers, meaning that if you already have some Milwaukee power tools then the bare tool is all you need to get started. Milwaukee products also tend to come with decent warranties as standard, although as yet we have not been able to find out the exact length for this product’s warranty. Bare tool that does not come with charger or battery. This tool would be a great addition to any workshop – particularly those which already have compatible Milwaukee products for the ease of sharing batteries and chargers. It has some really advanced features, such as the RedLink intelligence and the battery indicator gauge and is our second cheapest product after our budget pick. Having said that, it is powered by just 12 Volts and as such, may not have the desired power that some of our professional impact driver operators have. Firstly, after your purchase, you should carefully read the manufacturer’s instructions and guarantees to ensure that you know how to care for your new tool properly and that which parts and accessories are covered by any warranty. Here are a few basic guidelines as to how to care for your tool. Firstly, you should never leave your impact driver in the open air outside. It should be stored in a clean and dry area that is moisture and dust free. This will enhance its lifespan. Given that one of the most common accessories for impact drivers on sale today is their bag or storage bag, it would be prudent to use this when you are not using your tool. Spare battery packs and chargers should also be stowed away in this manner. If for any reason you suspect that your impact driver has been damaged or is broken then you should cease to use it immediately and contact the manufacturer for any necessary checks or repairs. Lastly, ensure you keep the instruction booklet and guarantee paperwork as you never know when you might need them! Following our simple advice should mean that your new impact driver lasts a long time. So, by now you have read our impact driver reviews and should know all about these wonderful tools. Depending on your needs, whether you a professional looking to do some drilling into concrete or simply someone who is looking to do more demanding DIY jobs in the home, you should have found that we have provided options for you as to which would be the best impact driver for you that you can find on sale today. For those on a budget, our budget pick is excellent value and even comes with accessories such as a Phillips bit and LED lights. If you’re after something more advanced, then our recommended DeWalt DCF887D2 should be right up your street. To ensure that your chosen impact driver really is the right one for you, check out our report by accessing one of our social media pages.